My final recipe of the year was a bust! BOOO!!!! Can you believe it?!?!? I can’t! The only consultation I have to this catastrophe is that it makes for good blogging and reader amusement. In a 4- or 5-qt. slow cooker, layer the rice, squash, onion and turkey. Add broth; sprinkle with salt, pepper and thyme. Cover and cook on low for 7-8 hours or until a meat thermometer reads 170°. Remove turkey; cut into slices. Stir cranberries into rice mixture; serve with a slotted spoon. Serve with turkey. Yield: 4 servings. First off, a big thing I learned this week is how expensive a turkey breast is! Wow! I almost paid more for the 3 lb turkey breast than I did for a 12 lb whole turkey! Sheesh! Good luck finding (2) 8 oz turkey breasts. I could only find 3 lb ones. 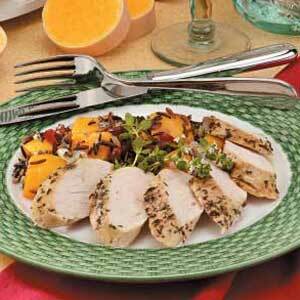 I did buy a turkey breast that was pre-seasoned and it was really good! I would recommend that! I’m not sure how one goes about peeling a butternut squash. I used a regular carrot peeler, but it seems like there should be an easier way. I thought about googling it while I was in process but my hands were all messy. Second point learned about butternut squashes… while holding the peeled version an orange substnace sticks to your hands like super glue. I washed my hands several times and even scrubbed them with a wash cloth while in the shower and I still had a film covering my fingers. Weird! It eventually went away. I’m not sure what constitutes a “medium sized” butternut squash. Upon further reflection, I believe mine may have been a “large”. The downfall of my entire recipe… mine needed to cook longer than 7-8 hours. Who knows… maybe 8.5-10 hours?? It would have been DELICIOUS! OK, biggest low point is that my crockpot cooked for 8 hours and my food was not done!!!!!! Agghhhhhh! I had even turned up the temp to high around hour 6 so it cooked on high for 2 hours. Hour 8 landed around 6pm to 6:30 and I had a hungry baby, a hungry momma and a hungry husband wanting to eat. I was so upset about the crockpot that I wasn’t sure what to do. I though about putting it in the oven to get it to cook faster but decided that would take too long. 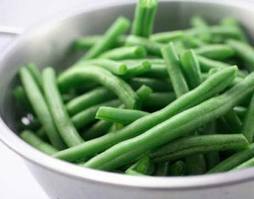 So we ended up having BLT sandwiches and baked potatoes… and green beans. What a way to end my new recipe experience! BLT sandwiches and baked potatoes… those don’t even go together! I decided to let the crock cook on low over night. BAD IDEA!! In the morning the meat was done and delicious! But the rice was extremely mushy and the squash was on the verge of being too mushy as well. That makes for bad texture issues! The flavors ended up being really good, but the mushy rice is hard to handle. I want to try this recipe again to see if I can get it right, because I think it really would be yummy. Well friends, what a year we have had together! I’ve loved hearing from you, either in comments left here, on Facebook or just in passing, that you’ve tried a recipe and liked it, or you made some adjustments and made it better! My year of new recipes has been such a great experience for me, thanks for following along on the journey. So what’s in store for What’s For Dinner in 2011? Check back next week for the low-down on what’s coming up!! A couple weeks ago, I had been flipping through my cookbook looking for different recipes to try and for some reason every recipe that caught my eye required turkey leftovers from Thanksgiving or Christmas. I unfortunately didn’t have turkey leftovers from Thanksgiving or Christmas sitting in my freezer waiting to be used. So I decided to go out, buy myself a turkey and cook it up! This for me was a feat. Thanksgiving 2009, Jeff and I didn’t travel to see family and decided to have a Thanksgiving feast at our house. I spent days stressing about cooking the turkey until Jeff decided to save me from myself and took over the turkey baking responsibilities. What I discovered is that baking a turkey is about the simplest thing you can do. The only thing you need is a turkey baking bag and you’re set to go. In a large saucepan, bring the carrots, onion, celery and broth to a boil. Reduce heat; cover and simmer for 15 minutes or until vegetables are tender. Remove from the heat. Stir in the turkey, soup, sour cream, Worcestershire sauce, salt and pepper. Spoon into a greased 2-qt. baking dish. In a large bowl, combine the flour, baking powder and salt. 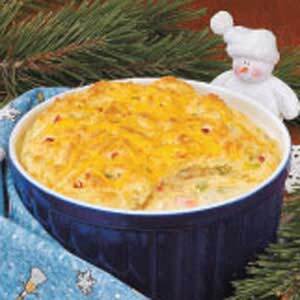 Combine milk, eggs, 3/4 cup cheese, green pepper and pimientos; stir into the flour mixture until combined. Drop by tablespoonfuls over the hot turkey mixture. Bake, uncovered, at 350° for 40-45 minutes or until golden brown. Sprinkle with remaining cheese. Bake 3 minutes longer or until cheese is melted. Yield: 4-5 servings. The biggest thing I learned this week is that a 12 lb turkey does not give you 12 lbs of meat! I guess I knew that was going to be the case, but the actual amount of meat I got caught me a bit off guard. My 12 lb turkey only yielded 5 lbs of cooked meat! Who knew?!?! I thought I was saving big bucks on my turkey that only cost $.92 per pound, but when you figure you only get to actually eat half of that weight, I’m not really saving big bucks. I did add the green pepper, but didn’t have any pimientos so I didn’t add those. I would say I found out the green pepper didn’t add anything to the over all flavor and I probably won’t bother with it next time. I was skeptical of adding only 1/4 cup of broth to the vegetables and letting them boil for 15 minutes, but it actually worked out ok! I thought they would burn to the pan, but they did not. The crust topping when mixed was more runny than I was anticipating, since the directions said to spoon the mix onto the turkey mixture. I more like poured it onto the mixture. It did bake fine though. Aside from having to pre-bake an entire turkey, this was a really easy and relatively quick recipe to make. I liked this recipe a lot better than the Chicken Potpie recipe that I made a few months ago. The leftovers were delicious as well. This would be a difficult recipe if you didn’t have turkey sitting around waiting to be used. I do think you could easily adapt this to chicken. All in all I really enjoyed this recipe. Baking my first turkey (for no particular reason) was exciting and this recipe was a great way to use up the left overs! As you may have noticed, Week 49 didn’t quite make it. Sorry about that. There was neither time, nor inspiration. But no fear, we are back on track and cookin’ down the road to one full year of new recipes. I can’t believe we’re already on week 50! Wow! My inspiration this week comes via my current weather situation. It’s cold and blustery here in Duluth, MN. As I type, the wind is blowing and snow is swirling by the window. I will admit it’s only week 2 of living in northern Minnesota and I’m ready for nice weather to arrive. They tell me there is still 4.5 months to go until that happens. In the meantime, I’ve taken to wearing long underwear. I HATED long underwear as a kid. There were days in South Dakota when my mom would make me wear long johns to school and I hated it! They made my pants feel weird, and to me, the trade-off of warmth was not worth the strange discomfort of your pants sticking to your legs. Ahhh, how times have changed! I’ve worn long johns for 5 days in a row now and am thinking I will need to soon invest in more as they seem to be a fast growing staple in my wardrobe. The discomfort of your pants sticking to your legs it a small price to pay for staying warm. I even made Ava wear tights under her pants today. I am my mother at last. All that to say, all week I’ve been craving a nice, thick, hot soup. Thumbing through my cookbook, I found this recipe that sounded delicious for the occasion. 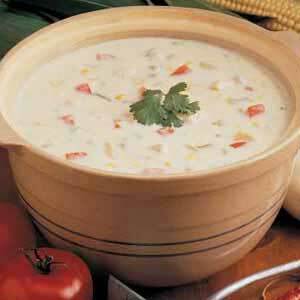 Have a look at Mexican Chicken Corn Chowder. In a Dutch oven, brown chicken, onion and garlic in butter until chicken is no longer pink. Add the water, bouillon and cumin; bring to a boil. Reduce heat; cover and simmer for 5 minutes. Stir in the cream, cheese, corn, chilies and hot pepper sauce. Cook and stir over low heat until the cheese is melted; add tomato. Sprinkle with cilantro if desired. Yield: 6-8 servings (2 quarts). First off, I don’t know what the deal is with a dutch oven. I’ve seen lots of recipes that call for one and I don’t know what the big deal is. I just used a regular pot. If someone has insight to the dutch oven, let me know! Second, 2 cups of half and half seemed like a lot! I could feel the cellulite growing on my legs just thinking about it! So I used 1 cup of half and half and 1 cup of 1% milk. Third, instead of the can of cream corn, I put in half a bag of frozen corn (the small size). I liked this better because, 1.) I don’t like cream corn and 2.) I liked the crunch that the frozen corn gave the soup. BIG TIP: Once the cheese is melted you need to serve the soup right away. I had made my soup while waiting for Jeff to get home. He was about 15-20 minutes later than I though he would be so my soup sat and simmered that whole time. I had checked the soup about when the cheese had all melted and it looked wonderful! Thick and creamy… Yummm! But after sitting for the extra time, something happened to it and it got watery. Booo! I was really disappointed! This soup definitely hit the spot for a cold winters day. All those dairy produces really make for a heavy soup. I shouldn’t have had seconds. I was very disappointed about the creamy-ness breaking down before we ate! Ava wasn’t too excited about it. All in all, I liked this soup a lot. 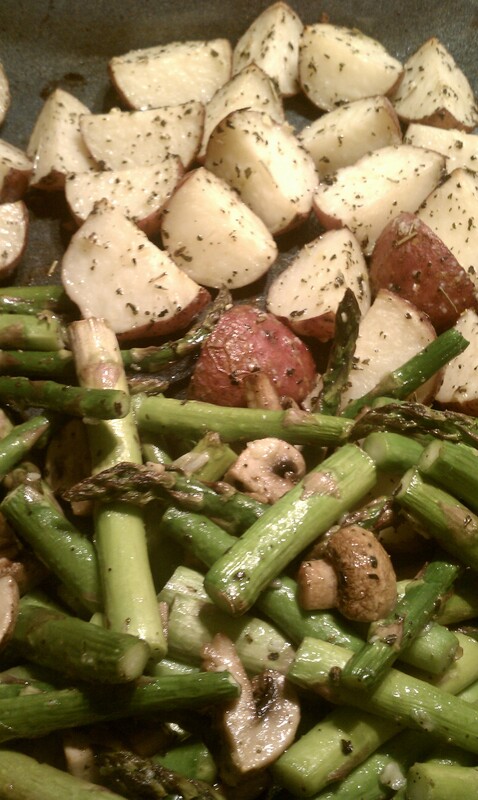 It was warm and tasty and perfect for a cold winters night.